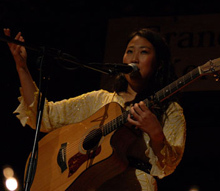 Susie Suh is a Korean American adult alternative/folk-rock singer-songwriter. Her music is often compared to Fiona Apple, Sarah McLachlan, and Aimee Mann. Suh cites Joni Mitchell and Beth Gibbons among her influences. She is closely affiliated with the Hiphop group, Zion-I. Suh attended Brown University, where she graduated with a Bachelor's degree in English in 2002. Her debut album, Susie Suh, was produced by Glen Ballard and released on Epic Records in 2005. Off that album 2 songs have been used on One Tree Hill, Recognition and Light On Your Shoulder. Also, another song that is currently not available has been heard on One Tree Hill called Give Me Heart. "Shell," from her self-titled release, was featured on the soundtrack of the 2005 film Must Love Dogs. A one minute crop of it was bundled with Sony Ericsson W800 mobile phones.